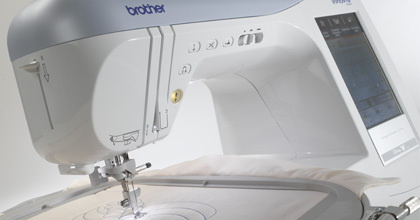 The Brother Innov-ís 1500D is designed for those who love to quilt & embroider. Dream up any creation and execute it on this extremely affordable machine. Large 10"x 6" embroidery area gives you plenty of room for your creativity. Monochrome 4.6" x 3.5" LCD touch screen control panel allows you to easily manage all your sewing and embroidery functions. Bobbin winding system allows independent bobbin winding while sewing or embroidering. Use the bright LED work lights to brighten up any project.